Look out the plane window at the right moment and the sight of the Himalayas lining the distant horizon will take your breath away. Wreathed in clouds, peaks capped in snow and sunshine, they stand implacable against the elements. Landing in Kathmandu, you’re almost disappointed to find your view curtailed by Shivapuri, Phulchowki, Nagarjun and Chandragiri – the hills that cradle the valley. Navigating the city’s mostly terrible roads, you look up to find even they are cloaked in a haze of pollution and dust. Many locals wear masks over their noses to protect them from the dust, but there’s no masking the crushing poverty that seems to grip so many of the city’s residents. The urban sprawl surrounding you is home to over five million people and going by first appearances, travellers could be forgiven for being eager to abandon Kathmandu for the stunning landscapes that lie just beyond. However, choose to linger and the city reveals itself – walk barefoot through ancient temples where the faithful still gather at sunrise, sit beside pristine white stupas bedecked with fluttering prayer flags, buy one of those intricate thankga paintings sold in teeming marketplaces and eat delicate steamed momos stuffed with meat and vegetables and Kathmandu will have claimed you. Getting around Kathmandu is easy. Just walk or risk life and limb by riding in one of the frenzied little Maruti taxis that rule the roads but be prepared to find yourself trapped in a moving disco – many drivers have inordinate fondness for loud Bollywood tunes. Every tourist starts at Thamel. Its narrow lanes are lined with shops that sell everything from travel gear and hippie clothing to bronze and wooden handicrafts. Jewellery nuts would be well advised to hand their wallets into the safekeeping of a parsimonious friend – you’ll find store after store brimming with tempting pieces. If there’s a golden rule while shopping there, it is this: Thou Shalt Always Bargain. Prices quoted to foreigners are not just double but frequently quadruple what shopkeepers are actually willing to settle for. A considerably cheaper shopping area can be found around the Hanuman-dhoka Durbar Square in the area of the city known as Basantpur. However, I’ve had my fill by then and I’m here instead for the glorious architecture. 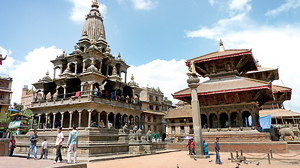 This complex of beautiful temples and shrines in the heart of the city includes both Buddhist and Hindu elements – the brochure lists 43 attractions. One of these buildings, Kumari-ghar, is home to a living goddess, the incarnation of the Taleju. he King’s residence until the last century, the old palace here is part of a sprawling site that was one of six monument zones dubbed UNESCO World Heritage Sites in the Kathmandu Valley. Try and get there before 4 p.m. so you can explore the Hanuman-Dhoka Palace museum (Entrance is included in the Rs.140 ticket). The exhibits include (far too many) photographs of the Royal Family of the Shah Dynasty – the last to rule over Nepal – along with a number of personal items: ogle the surprisingly modest royal bed, the King’s personal photography equipment and his private bicycle as well as gifts from foreign heads of state. Don’t miss the exquisite stone carvings that line the bath at Mohankali Chok – sunk 12 feet into the ground, the spigot is only the first of the breath-taking art the King literally immersed himself in. Ditto for Sundari Chok to the north where a sculpture hewed from a single block of stone depicts the defeat of the serpent Kaliya by a young Krishna. It might take some determination to climb to the top of the adjoining Nautaley Durbar, the nine-storied palace built by Prithivi Narayan Singh in A.D 1770, but the utterly exquisite wood carvings that frame every window and the view from the top are reward enough. If you’re inclined to submit to morbid curiosity, the new palace is close by. Visitors are apparently shown the very site, where in 2001 crown prince Dipendra allegedly shot and killed 10 members of his own family, including his father, King Birendra Shah, before he turned the gun on himself. Even though the conspiracy theories grow stale, the country remains beset with political turmoil. Nepal was made a republic in 2008 – when we arrive it is just in time to see its fourth attempt at passing a constitution created by the 600 plus strong Constituent Assembly fail. You’ll see more than one shop selling ‘singing bowls’ around here, but the Sound Planetarium (Tel: 9841348879) come highly recommended for their sound therapy. Also, at the edge of the stupa is Lama Tsonamgel’s Tushita Heaven Handicrafts. At the workshop above the shop you can see thangka artists in action, but the very beautiful, unbelievably intricate paintings aside, Lama himself is wonderful to chat with. 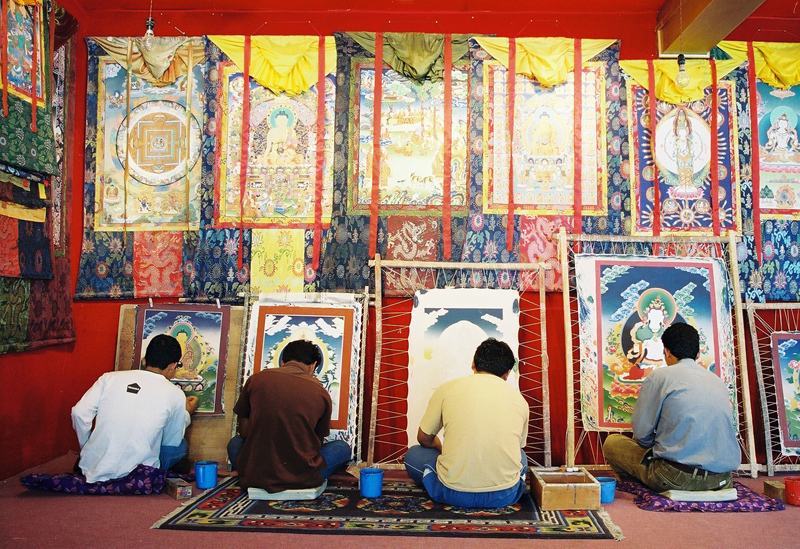 This one time monk, turned mathematician, turned artist is happy to explain the spiritual significance of their work, tracing for you the cycle of samsara. His gorgeous palette of vivid colours is made mostly from local stones with the fine cobweb of gold lines drawn in 24-karat gold. If you’re up for a little more walking, take a taxi from here to Patan (Rs.350/-). The Golden Temple of Lalitpur is hidden at the heart of a maze of streets. A Rs.50 entrance ticket will get you in. The temple, resplendent in gold and filled with elaborate carvings, is greatly beloved of the surrounding community whose members often serve here for a prescribed duration. You can take a break close by at the charming Dhokaima Cafe – locals swear by the cheese cake . ‘little priests’ when chosen must never cry when on duty, a local tells us, explaining that the young initiate is lavishly pampered. You can take a break close by at the charming Dhokaima Cafe – locals swear by the cheese cake (+977-1-5522113/info@dhokaimacafe.com). At the Patan Museum Café (+977-1-526-271) behind the Durbar Square, you can sample a typical Dhal Bhat, the Nepali equivalent to Sri Lankan rice and curry. It’s a little pricier, but their organic salads are made with vegetables grown on site. After days baking in the sun, walking from one site to the next, we’re ready to wrap up our stay with a massage. Despite their spartan interiors, the Sotai Centre (sotaicentre@gmail.com/9851054787) offer the most incredible ones – at Rs.1000 for a 90 minute massage, they’re more than worth the price. I’m left with only one thing undone on my to-do list. Time constraints prohibit a trip to see Everest, but such flights which reportedly cost $250 are available via Buddha Air (http://buddhaair.com), Yeti Airlines (http://yetiairlines.com) and Agni Air (http://agniair.com/). Clearly, Kathmandu demands a second visit. Published in the Sunday Times, Sri Lanka on August 19, 2012. Words by Smriti Daniel. Tags: What to see do and eat on a visit to Nepal's capital city Kathmandu. Bookmark the permalink. Pingback: Final preparations are HAPPENING! « Nepal • 2012 • The "Everest Build"